Landscape Discount offers two different gravel paver solutions which are both effective in providing a strong, durable, low maintenance, ascetically pleasing and permeable gravel surface which can be used daily. Pavers for use with gravel are available in either rolls or in panel form which is ideal for smaller projects. The following information pertains to our rolled pavers. 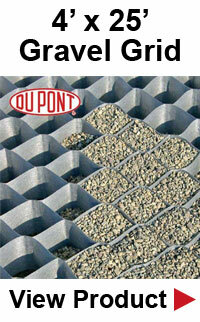 For information on the panel pavers intened for gravel use see bodpave. For larger projects the rolled pavers are ideal due to their easy installation. The material is simply rolled out into place. The material is available in 4' x 150' rolls which greatly reduces the installation time of a large project such as a parking lot or gravel road. Do you have a gravel driveway or parking lot with potholes or constant traveling gravel? Pavers for use with gravel provide both stabilization and containment for gravel in both parking lot and road applications. One of the most effective paver gravel systems on the market are the EZ Roll Gravel Pavers by NDS. It effectively reduces erosion and helps in maintaining the look as well as the functionality of a gravel road or parking lot. This paver which is made with 100% recycled materials minimizes the surface water runoff from a gravel road and presents a sustainable and attractive alternative to the traditional asphalt or concrete. It is highly recommended to use for golf cart paths, jogging tracks, service roads, bike paths, RV and boat access and parking, truck and cart wash-down areas, overflow parking lots, fire lanes, roadways shoulders, construction entrance soil stabilizations, and emergency vehicle access roads. Aside from the recommended load applications, the EZ Roll Pavers for gravel are an effective solutions also for erosion control in swales and on slopes. How it is used? These pavers are an effective load transfer paving systems that is especially designed to be placed right there on the crushed run and clean stone or a sandy gravel base. It is also designed to transfer the vehicle loads directly to the base materials which allows light to heavy vehicular traffic over the surface without any damage to the structure below. 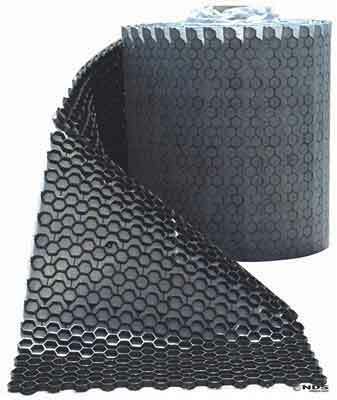 The honeycomb-like cell paver designs effectively helps in preventing gravel migration as well as the rutting that might deteriorate the gravel surface. These paves are designed with two features that can effectively reduce lateral movement once installed. Stakes prohibit the material from shifting once installed and the side clips allow multiple rolls to be connected further anchoring the material in place. Aside from the clips and stakes, the weight of the gravel within the cells also help to secure the material's placement as the pavers feature a fused geotextile on the bottom of the membrane which prevents gravel from moving underneath the material. These pavers will not only help in the erosion control with a very low maintenance but it will also make the road even more aesthetically appealing. Filling the cells with gravel just above the top surface of the cells, may be 0”-2” above the top cells, will allow the gravel to sit atop the certain grid work project. This will ensure that most part of the grid-work will be fully covered all the time. Occasionally, the surface may require to be re-graded in order to re move all the surface ruts that may have shifted the gravel paver surfaces. The said regarding will be purely aesthetic so we can expect that it will not have an impact on the structural compactness even if the surface of the grid work is left uncovered or exposed. There is really only one design difference between the two rolled paver types. Both pavers share the same grid structure, however the gravel pavers feature a fused geotextile to the bottom of the material. This acts as a “cup” to keep the gravel within the cell structure as well as prevents agains gravel from becoming trapped underneath the material and creating bubbles. The pavers for gravel also are shipped with stakes included due to the fact that gravel is more prone to shifting post installation than grass.